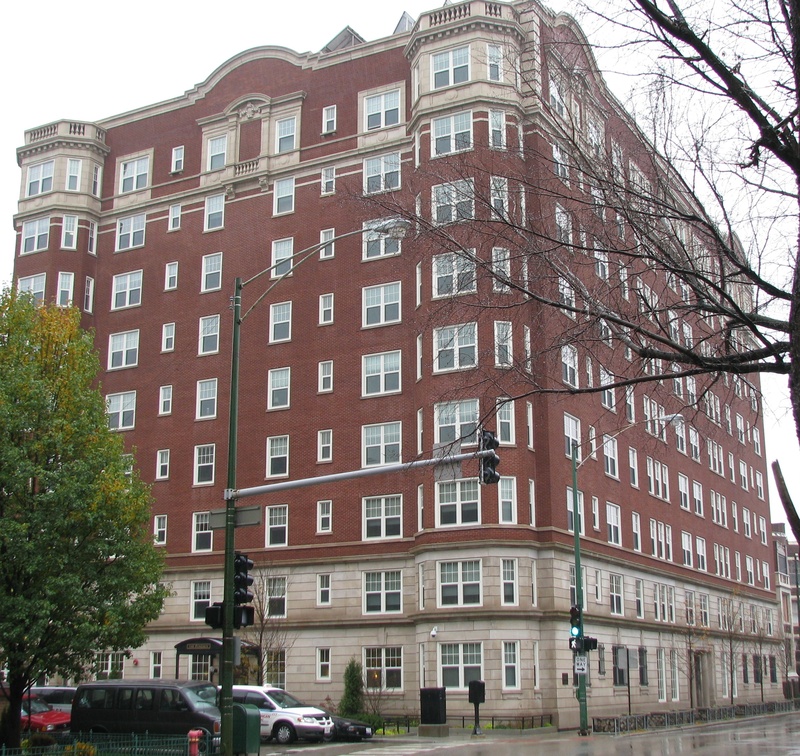 But Woodyard said the rehabilitation of the Pomeroy Apartments, “which transformed from an eyesore to a jewel,” took place “in a little more than a year’s time,” since renovations began in September 2010. He added that Pomeroy was the CHA’s last senior building to be rehabbed under the Plan for Transformation. The news that the building for senior citizens was now ready for occupancy after just a little more than one year was amazing to Steve Meiss, director of HUD’s Illinois Office of Public Housing, who was in attendance at the opening ceremony. “It’s phenomenal how quickly and how relatively smoothly this development was done,” Meiss said. “It [the redevelopment deal] closed on August 26, 2010, it was under contract on August 27, 2010, and here we sit today in the completed building. It’s practically a miracle. “And trust me most projects don’t go as well as this one here. So I just want to express the gratitude of HUD for making our job easier, and for making us proud. And for clearly illustrating what can be done when people put their minds to do it,” Meiss added. Ald. Harry Osterman (48) said the event was “a very proud day for community” and that the CHA has really lived up to their commitment, especially given the previous conditions the former seniors were living in before the building closed. 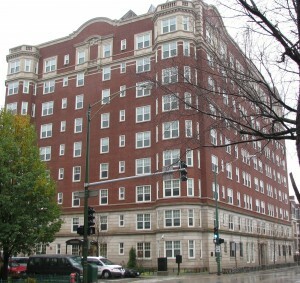 Osterman credited the American Reinvestment and Recovery Act, the stimulus bill President Barack Obama pushed through the U.S. Congress in 2009, and the support of U.S. Rep. Jan Schakowsky (D-Chicago) with providing $18.3 million in funding the renovations at the Pomeroy. After the opening ceremony, the public officials and some of their guests toured the building. The building was a hit with at least one of its new tenants. 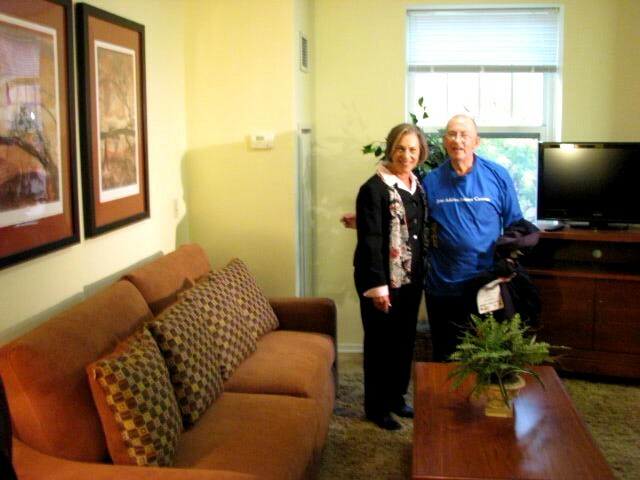 69-year-old Foreence, a recent breast cancer survivor, told Residents’ Journal during the tour that she liked her small one-bedroom apartment, which she described as “studio-like.” Foreence showed a reporter her apartment and said she was happy with her unit. “It’s good,” she said, matter-of-factly. 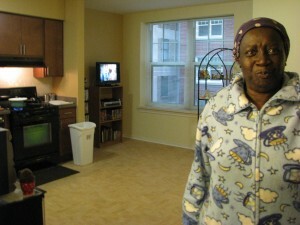 Foreence said she began renting an apartment in the private market after she left the hospital following a bout of breast cancer. But the rent in the private market was too high, and her daughter found out about the Pomeroy. CHA CEO Woodyard said the Pomeroy building is now considered an environmentally friendly “green” project and was “confident” it will receive LEED-Platinum certification. Some of its new amenities include “a geo-thermal system, a roof terrace, a courtyard terrace, solar-thermal and photovoltaic collection panels, a furnished lobby and a green vegetated roof that provides insulation for the building,” according to the CHA press release. Water-conserving appliances and fixtures are located in all the apartments, and green label certified floor coverings are located throughout the building. The Pomeroy is managed by the Habitat Company. 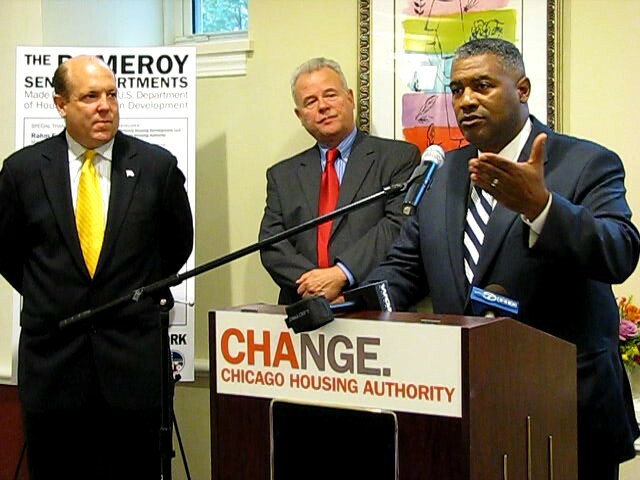 Previously there were 120 apartments, but now there are 104 public housing units and one market rate unit, including 21 ADA units for seniors with disabilities. 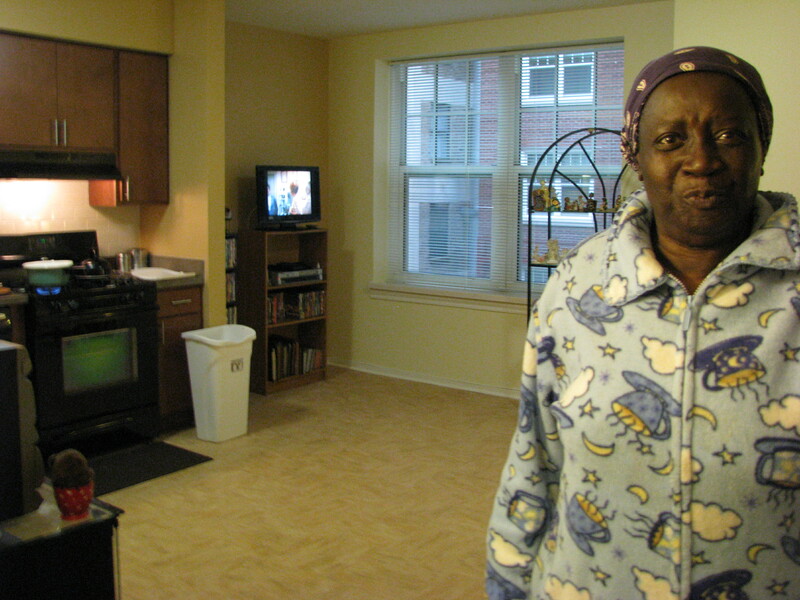 The public housing senior citizen building is also designated as a “smoke-free zone,” along with the CHA Kenmore Senior Apartments, the West End Jackson Square and West Side Roosevelt Square mixed-income communities, under the CHA pilot “Tobacco Prevention Project,” proposed by the City of Chicago in June 2010, and funded by the federal government through a two-year grant. You can read more about the ‘smoke-free zones’ at: https://wethepeoplemedia.org/homepage/at-cha-mixed-income-sites-owners-exempt-from-smoke-free-zones/. This entry was posted	on Thursday, November 17th, 2011 at 7:06 pm. You can follow any responses to this entry through the RSS 2.0 feed. You can leave a response, or trackback from your own site.